The Mystery Machine – Jenny and Jonathan Got Married! Hi, this is Jenny again. 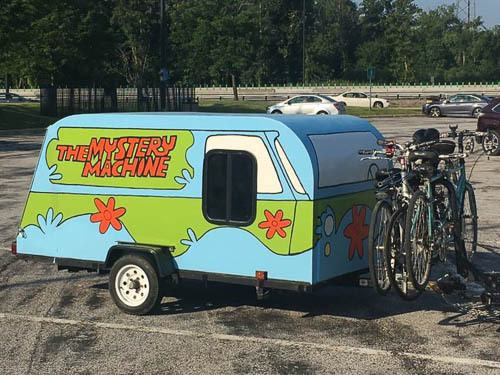 We saw the Mystery Machine on the Ohio Turnpike this summer. Well, we saw it in camping-trailer form, at least. 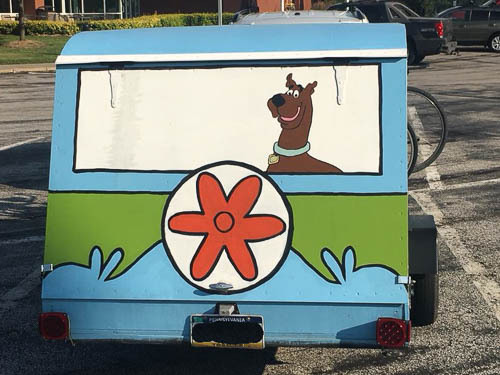 The man who drove the auto attached to this Mystery Machine resembled Shaggy! Apparently this Mystery Machine is from Pennsylvania. I grabbed these photos when we stopped at the same service plaza. We’ll update this blog soon with more updates about life in New Kensington. In the meantime, be sure to check out my new blog, The Parnassus Pen, at www.parnassuspen.com. Here is a fun link to 13 Spooky Haunted History Podcasts. Enjoy!